Johor is a Malaysian state, located in the southern portion of Peninsular Malaysia. It is one of the most developed states in Malaysia. The state capital city of Johor is Johor Bahru, formerly known as Tanjung Puteri (Malay for Princesss Cape). Its royal city is Muar. The old state capital is Johor Lama. Johor is surrounded by Pahang to the north, Malacca and Negeri Sembilan to the northwest, and the Straits of Johor to the south which separates Johor and the Republic of Singapore. The state also shares a maritime border with the Riau Archipelago from the east and Riau mainland on the west by the South China Sea and the Strait of Malacca respectively, both of Indonesian territories. Johor is also known by its Arabic honorific, Darul Tazim, or "Abode of Dignity", and as Johore in English. In the early 16th century, the Sultanate of Johor was founded by the Alauddin Riayat Shah II, the son of Mahmud Shah, the last Sultan of Malacca who fled from the invading Portuguese in Malacca. Johor sultanate was one of the two successor states of the Melaka empire. Upon Malaccas defeat by the Portuguese in 1511, Alauddin Riayat Shah II established a monarchy in Johor which posed a threat to the Portuguese. The Sultanate of Perak was the other successor state of Malacca and was established by Mahmud Shahs other son, Muzaffar Shah I. During Johors peak the whole of Pahang and the present day Indonesian territories of the Riau archipelago and part of Sumatra Island was under Johors rule. A series of succession struggles were interspersed with strategic alliances struck with regional clans and foreign powers, which maintained Johors political and economic hold in the Straits. In competition with the Acehnese of northern Sumatra and the port-kingdom of Malacca under Portuguese rule, Johor engaged in prolonged warfare with their rivals, often striking alliances with friendly Malay states and with the Dutch. In 1641, Johor in co-operation with the Dutch succeeded in capturing Malacca. By 1660, Johor had become a flourishing entrepôt, although weakening and splintering of the empire in the late seventeenth and eighteenth century reduced its sovereignty. In the 18th century, the Bugis of Sulawesi and the Minangkabau of Sumatra controlled the political powers in the Johor-Riau Empire. However, in the early 19th century, Malay and Bugis rivalry commanded the scene. In 1819, the Johor-Riau Empire was divided up into the mainland Johor, controlled by the Temenggong, and the Sultanate of Riau-Lingga, controlled by the Bugis. In 1855, under the terms of a treaty between the British in Singapore and Sultan Ali of Johor, control of the state was formally ceded to Dato Temenggong Daing Ibrahim, with the exception of the Kesang area (Muar), which was handed over in 1877. Temenggong Ibrahim opened up Bandar Tanjung Puteri (later to become Johors present-day capital) in south Johor as a major town. Temenggong Ibrahim was succeeded by his son, Dato Temenggong Abu Bakar, who later took the title Seri Maharaja Johor by Queen Victoria of England. In 1886, he was formally crowned the Sultan of Johor. Sultan Abu Bakar of Johor (1864–1895) implemented a state constitution, developed a British-style administration and constructed the Istana Besar, the official residence of the Sultan. For his achievements, Sultan Abu Bakar is known by the title "Father of Modern Johor". The increased demand for black pepper and gambier in the nineteenth century lead to the opening up of farmlands to the influx of Chinese immigrants, which created Johors initial economic base. The Kangchu system was put in place with the first settlement of Kangkar Tebrau established in 1844. The decline of the Kangchu economy at the end of the 19th century coincided with the opening of the railway line connecting Johor Bahru and the Federated Malay States in 1909 and the emergence of rubber plantations throughout the state. Under the British Resident system, Sultan Ibrahim, Sultan Abu Bakars successor, was forced to accept a British adviser in 1904. D.G. Campbell was dispatched as the first British adviser to Johor. From the 1910s to the 1940s, Johor emerged as Malayas top rubber producing state, a position it has held until recently. Johor was also until recently the largest oil palm producer in Malaysia. During World War II, Johor Bahru became the last city on the Malay peninsula to fall to the Japanese. Allied Forces, Australian, Malayan and Indian forces held out for four days in what was known as the Battle of Gemas, the General Yamashita Tomoyuki had his headquarters on top of Bukit Serene and coordinated the downfall of Singapore. Johor gave birth to the Malay opposition which derailed the Malayan Union plan. Malays under Dato Onn Jaafars leadership formed the United Malays National Organisation (UMNO) in Johor on 11 May 1946. (UMNO is currently the main component party of Malaysias ruling Barisan Nasional coalition.) In 1948, Johor joined the Federation of Malaya, which gained Independence in 1957. Johor is the 5th largest state by land area and 2nd most populous state in Malaysia, with a total land area of 19,210 km2 (7,420 sq mi), and a population of 3,233,434 as of 2010. It is the southernmost state in Peninsular Malaysia, and is located between the 1°20"N and 2°35"N latitudes. The highest point in Johor is Gunung Ledang (1276 m). Gunung Ledang is also known as Mount Ophir. Johor also has a 400 km coastline on both the East and the West coasts. Johor has 8 large islands with numerous smaller ones, namely Pulau Aur, Pulau Besar, Pulau Dayang, Pulau Lima, Pulau Pemanggil, Pulau Rawa, Pulau Sibu, Pulau Tengah and Pulau Tinggi. The Iskandar, Johor (also known as Iskandar Development Region and South Johor Economic Region), encompassing Johor Bahru, Johor Bahru Tengah, Kulaijaya, Pasir Gudang and Nusajaya is a major development zone in Johor. It was named after the late Sultan Iskandar Al-haj. At 2215 km², it is two-and-a-half times bigger than Singapore and 48 times the size of Putrajaya. It is intended to draw investment and business to Johor and will be among the biggest development projects in Malaysia. The state administrative capital will be moved to Nusajaya. Residential areas include Bukit Indah and Horizon Hills townships. 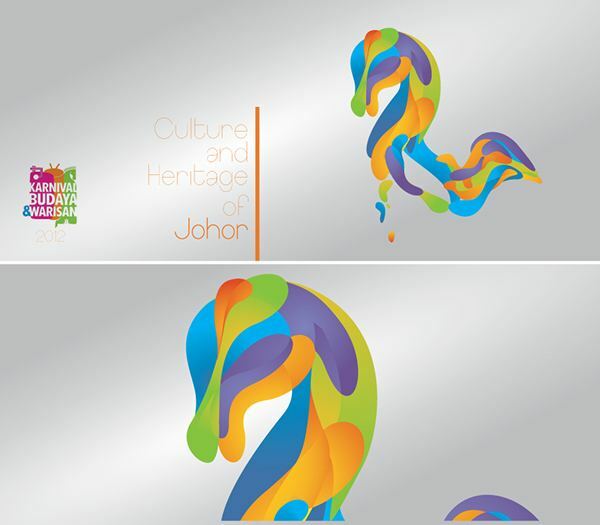 The culture of Johor is influenced by visitors and traders throughout history. A major influence was the Bugis – who first set foot in Malaysia in Johor before continuing on to Melaka, Linggi, Selangor, Pahang and Terengganu – Javanese and the Arabs. They had a powerful impact on the politics of Johor, Pahang, Terengganu and Selangor. The strong Arab influence is apparent in art performances like Zapin and Hamdolok, musical instruments like gambus. Other visible legacies in Johor Bahru are the Arabic names of places such as Wadi Hana and Wadi Hassan in areas populated by the Arab community from Hadhramaut in the southeast of Yemen. Wadi means valley in Arabic. Cuisine in Johor is influenced by Arabs and cultures of the surrounding Maritime Southeast Asia. Some dishes are a blend of ingredients not found anywhere else in Malaysia. Due to their difficult and sometimes complicated recipes, some can only be sampled during celebrations and state banquets. Laksa Johor is from Johor. It differs from Laksa Penang by having coconut milk added during cooking. It also differs from other laksas by using spaghetti instead of rice-based noodles. 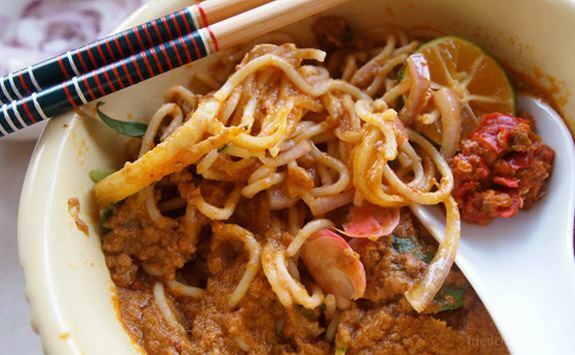 Mee Bandung Muar is also a dish originated from Johor, specifically from Muar. The term bandung is not derived from Bandung, Indonesia but is a term for anything that is mixed from many ingredients. One of the most important ingredient is dried shrimp. Arisa – A unique chicken dish that is very rare nowadays, and is normally served to the royalties and social elites of Johor at formal functions and celebrations. Satay – is a popular food in Malaysia. Made from marinated meat or chicken and burnt on charcoal grill. Cooked satay is dipped in special peanut sauce. A favourite Malay food in Johor, mostly found in Johor Bahru and Muar. Telur pindang – Eggs boiled together with herbs and spices, popular during wedding feasts in Johor. Roti Jala or Roti Kirai – The name is derived from the Malay word roti (bread) and jala (net). A special ladle with a five-hole perforation used to make the bread looks like a fish net (picture in the works). It is usually eaten spicy with curry or sweet with serawa. Serawa is made from a mixture of boiled coconut milk, brown sugar and pandan leaf. Nasi Beriani Gam – A biryani rice dish originating from India with a cooking method very similar to Hyderabad biryani but with spices adjusted to suit the Malay palate. This dish is very popular in Batu Pahat District. Kacang Pol- This dish is influenced by Arab Culture where special baked bread was served with special sauce and a sunny side up egg. Otak-otak – Steamed/Grilled fish cake usually served wrapped in sticks of coconut leaves. Two of the most popular varieties are Otak-otak Muar (spicy) and Otak-otak Gelang Patah (sweet). Mee Soto – This Indonesian origin food is very popular in Johor. People may have change noodles with rice or vermicelli rice according to their preference. Combination of either noodle, rice or vermicelli rice is added with peanut, beansprout and chicken meat. These combination then is poured with special soup. This soup was made from chicken stock and some other spice. Enjoy it while its hot. Mee Bakso – This is almost identical with soto, only this dish have meatball instead of slices of chicken meat. Lontong – Dish using combination of pressed rice and special coconut soup with vegetables. Served with boiled egg and chili. Burasak – It is a type of Buginese food. Kerutup ikan – Fish is steamed with variety of local fragrant leaves. Pecal – It is a Javanese traditional cuisine which consists of long beans, slice of cucumber, beansprout, tauhu, tempe mix with special peanut sauce. Mee Siput – It is a mixture of flour that will expand in term of size when deep fried. Rojak Petis – It is a combination of local vegetables mix with special black coloured sauce made mostly from shrimp(Otak Udang). ABC – ABC is abbreviation of Air Batu Campur or known as Ice Kacang Johor. It is a special desserts created from shaved ice added with corn, jelly, redbeans, groundnut, syrup, pasteurised milk, and liquid chocolate. There are a few Johorean dishes with Javanese influences due to the high number of Javanese settlers in the state. These include lontong, nasi ambeng, satay and bontrot or berkat – both traditionally served after feasts like wedding ceremonies, Yasinan and others; and ungkep.